‘Sonic the Hedgehog’ – Sega Returns! Over the past few months, iPhone gamers have all been wondering what in the world happened to Sega. They released Super Monkey Ball [App Store], then Columns Deluxe [App Store] not too long after, and then just disappeared until tonight when Sonic the Hedgehog [App Store] was finally released–Surprising us all. There have been some good ports for the iPhone and some bad ports for the iPhone. Sonic the Hedgehog safely lies somewhere in the middle. The default display mode for the game stretches the screen to fit the aspect ratio of the iPhone and overlays a transparent D-Pad on one side and matching transparent button to jump on the other. This not only makes the game look slightly blurry, but in my testing with an iPhone 3G resulted in frame rates which are less than desirable for a game that is all about going fast. 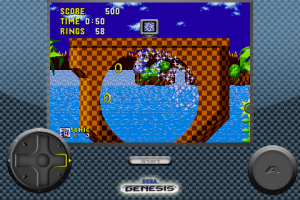 Fortunately, Sega included a second view style in to the game that does away with the transparent controls and instead centers the screen in its original resolution of 320×224 for a crysttal clear representation of the original. In the smaller screen size, the framerate, while improved, still isn’t perfect. 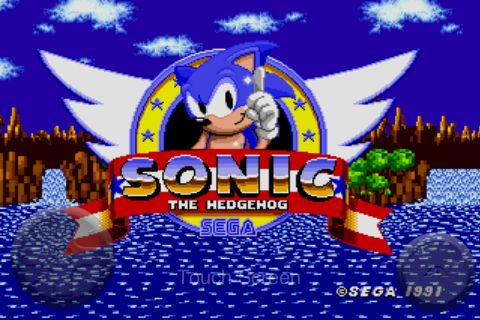 There is still noticeable slowdown when Sonic gets hit and loses all his rings, but it’s quite playable. Disabling the game’s sound also increases performance, but I don’t think this is something you should ever have to do. If you have a 2nd generation iPod touch, you’re in luck because the game runs noticeably better than on the older iPhone hardware. 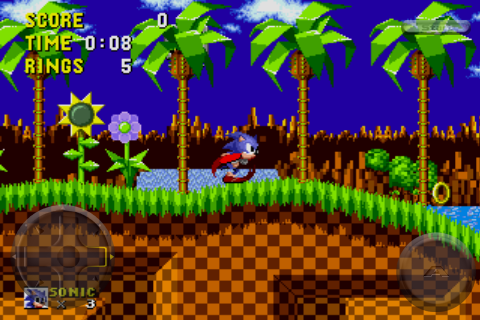 The simple controls of all Sonic games translate well to the iPhone, and since all you really ever need to be doing is running forward or jumping, none of the problems exist with the virtual D-Pad that other games which require more precise controls have. Also, I was surprised to find that if you quit Sonic the Hedgehog mid-level, the game remembers exactly where you were and you’re given the opportunity to continue the next time you start the game. It seems fairly obvious that Sonic the Hedgehog is little more than the Genesis ROM wrapped in an official Sega emulator. If this is the case, I think I speak for all iPhone gamers interested in classic titles when I say: Sega, please, release more games. You’re sitting on a gold mine here. Optimize the emulator a little more so it runs well on the iPhone then do absolutely nothing but release every good game from the Genesis library you still hold publishing rights to. Thanks in advance!